Colm Ó Fearghail awarded ICIDS 2018 Runner-Up Best Full Paper Award! 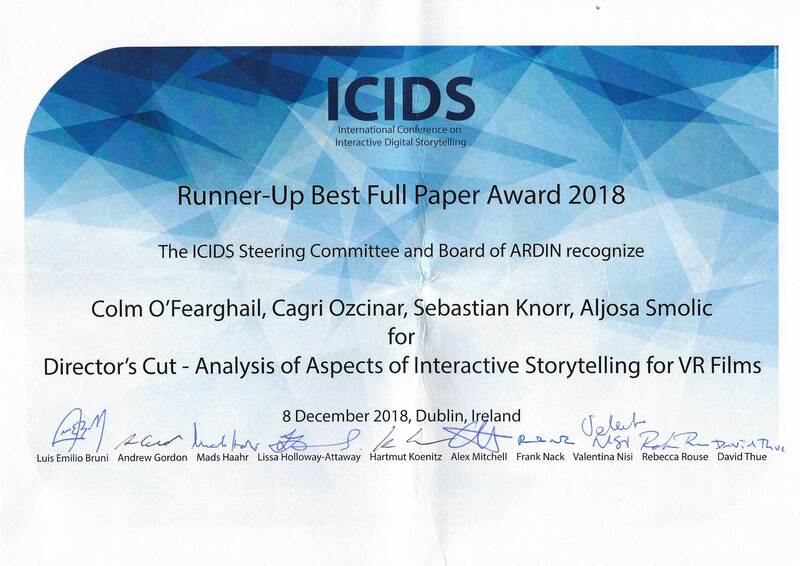 Congratulations to our student Colm Ó Fearghail for his Runner-Up Best Full Paper Award 2018 at ICIDS 2018 for his paper ‘Director’s Cut – Analysis of Aspects of Interactive Storytelling for VR Films’ co-authored with Cagri Ozcinar, Sebastian Knorr, Aljosa Smolic. ICIDS is the premier conference for researchers and practitioners concerned with studying digital interactive forms of narrative from a variety of perspectives, including the theoretical, technological, and applied design practices. The annual conference is an interdisciplinary gathering that combines technology-focused approaches with humanities-inspired theoretical inquiry, empirical research and artistic expression.